While the economy continues to improve and wages are finally beginning to inch up for most Americans, African Americans are still being paid less than whites at every education level. 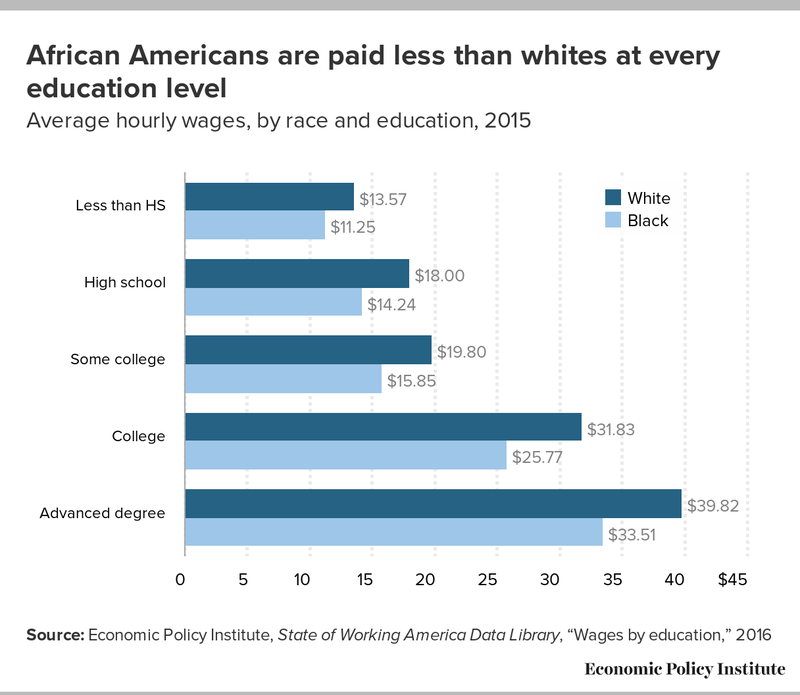 As you can see from the chart below, while a college education results in higher wages—both for whites and blacks—it does not eliminate the black-white wage gap. African Americans are still earning less than whites at every level of educational attainment. A recent EPI report, Black-white wage gaps expand with rising wage inequality, shows that this gap persists even after controlling for years of experience, region of the country, and whether one lives in an urban or rural area. In fact, since 1979, the gaps between black and white workers have grown the most among workers with a bachelor’s degree or higher—the most educated workers. More school will certainly increase wages, but education alone is not enough to overcome the effects of racial discrimination in pay. Closing this part of the racial pay gap begins with consistent enforcement of anti-discrimination laws in the hiring, promotion, and pay of women and minority workers, as well as greater transparency around within-firm pay by race, ethnicity, and gender.